Playing like a true champ, ONGC defeated Sesa Football Academy, Goa convincingly and booked their berth for the coveted I-League division 1. Early strike by the strikers Babatunde and Tarif Ahmed made the difference and the rookies from Sesa never got a chance to get back to the game. division 1 next season with absolute dominance. Their endeavor in the final leg has been a revelation. They have played like a champion, wining all but one match so far, and already achieved what they wanted before playing their last round match. The oilmen took the field to make early inroads. They got their first goal in the 5th minute thru Nigerian Badmus Babatunde. 13 minutes later it was time for Babatunde’s partner Tarif to score the second goal. 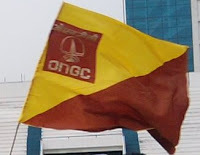 Sitting pretty on a two-goal lead, ONGC played posessional, controlled the game and kept the Sesa wards at bay. After coming very close to I-League division 1 in the last two seasons, the Mumbai outfit finally made it this time. 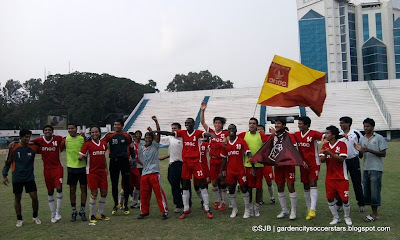 Mohammedan Sporting continued their dismal show by playing a 1-1 draw with Malabar United. Mohammedan took the field leaving behind their foreign imports that were unceremoniously released by the club management owing to pathetic performance in the final rounds of I-League division 2. They started-off in a shaky note, Malabar quickly utilized the situation and took lead in the 8th minute of the match by a goal from Nigerian Loveday. Neelandra Deewan scored the equalizer in 56th minute. Mohammedan should consider themselves lucky for not conceding any more goals. Malabar should have scored at least 4 more goals. They simply could not score goals, missed penalty, missed easiest of the easy sitters.